Dr. Frey is originally from North Dakota and graduated from the University of North Dakota with a Bachelor’s Degree in Natural Science. He went on to earn his medical degree from the University of North Dakota School of Medicine & Health Sciences. He then completed a residency in Psychiatry and a fellowship in Child & Adolescent Psychiatry at the University of Wisconsin Hospital and Clinics. Dr. Frey has previously practiced in a variety of settings including inpatient, outpatient, and a partial hospitalization program. He has also provided care for juveniles in a youth correctional center and conducted evaluations of court committed individuals. He now serves as one of the managing partners at Mental Health Solutions. Dr. Frey provides psychiatric evaluation and treatment for individuals of all ages. 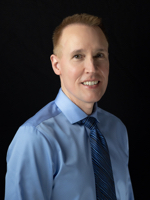 His skills include diagnosis, medication management, limited psychotherapy, and coordination of care with other treatment team members including therapists and primary care providers. Areas of special interest include Attention-Deficit/Hyperactivity Disorder (ADHD), Anxiety, OCD, Depression, and Autism Spectrum Disorder. Dr. Frey also has a special interest in Medical Informatics – the interface between healthcare and technology. Dr. Frey conducts psychiatric evaluations for diagnosis and treatment planning. After initial evaluation, his primary focus is on safe and effective medication management. Brief therapy techniques employed by Dr. Frey include cognitive-behavioral, interpersonal, supportive, solution-focused, and psycho-educational approaches. Dr. Frey is Board Certified in Child, Adolescent, and Adult Psychiatry by the American Board of Psychology and Neurology. He is a member of the Continuing Medical Education Committee of the American Academy of Child & Adolescent Psychiatry. He is also a Fellow of the American Psychiatric Association.